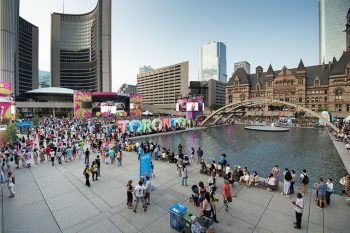 The City revitalized Nathan Phillips Square in order to host a greater number and variety of activities and special events. Festivals of varying sizes are held throughout the year to celebrate Toronto’s cultural diversity and spirit. Events at Nathan Phillips Square are free and open to the public and are produced by not-for-profit or charitable organizations. The Peace Garden was relocated from the middle of the Square to the west landscaped area, adjacent to Osgoode Hall and the new Law Courts Sculpture Garden. The Garden is organized around a reflecting pool and set between two elevated planting areas that are filled with flowering trees and native plants. At the center, a granite bridge will span the pool and connect to the relocated Pavilion that is nestled within the trees. At the north end of the pool, a rekindled eternal flame will sit within a vessel of water that cascades into the reflecting pool. The new Peace Garden can accommodate larger groups (for ceremonial purposes only) than the previous one, while providing more intimate spaces for smaller gatherings. Note: The Garden is not available as an event space. The skate pavilion and concession at the southwest corner of the Square provides skate rental and change room space, skating rink support facilities, a food concession, public washrooms and a generous upper level roof terrace for residents and visitors to take in the panoramic view of the Square. 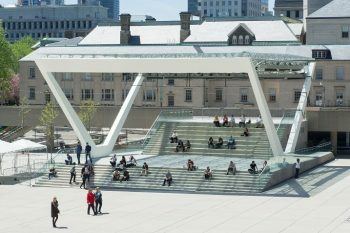 The revitalized Nathan Phillips Square houses a new, permanent stage that also acts as a landscape element and shade canopy on summer days. During the fall, winter and spring, the stage appears as an open, urban landscape that connects to the elevated walkways. Torontonians will also be able to use the stage as a set of two-tiered urban bleachers to view the open Square. Included is a versatile stage structure with an elegant roof canopy, wide stairs leading to the elevated walkways and performance support space connected below grade. The stage joins the existing council chamber, the ceremonial ramp and the three arches in Nathan Phillips Square. Behind the stage is a backstage area that accommodates an assembly area for performers, a secure holding area, technical support rooms, a stage management office, washrooms and an outdoor loading area for stage equipment. These spaces are located on stage level and are connected to the underground level by an elevator and stairs. Directly below the stage are all the major support spaces for the stage. This area includes the men’s and women’s change rooms and washrooms, Green Room, VIP suite, crew rooms, and separate offices for production management and visiting companies. 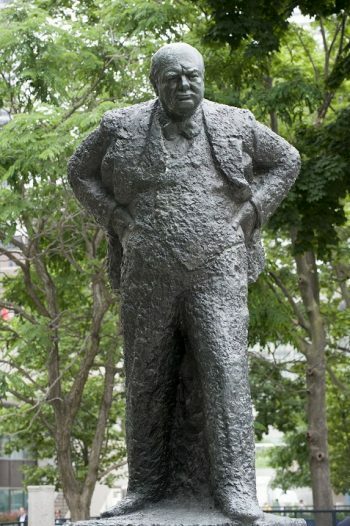 This three-metre high, rough textured bronze statue is also known as the Winston Churchill Memorial. 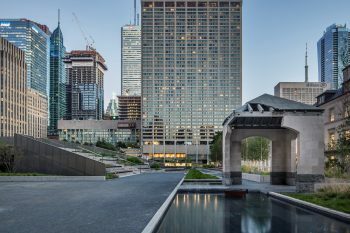 Prior to the revitalization, it stood at the southwest corner of Nathan Phillips Square, and now sits in the northwest corner of the Square known as Sculpture Court. The statue was donated to the City of Toronto by the late Henry R. Jackman in 1977 and is made from the original mould of a work by Oscar Nemon that stands in the Members Lobby in the British House of Commons. In 2002, members of the Churchill Society for the Advancement of Parliamentary Democracy and the International Churchill Society, Canada began to raise funds to improve the beauty and accessibility of the Square. 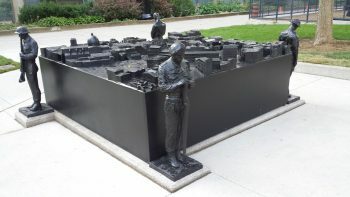 Upon meeting with staff from the City, the area was improved with benches, landscaping and information panels that portray a different dimension of Churchill’s life and achievements. The ancient white granite column is 2.1 metres high. This unique column was presented in 1957 to Mayor Nathan Phillips, Q.C., by the Hon. Umberto Tupini, Mayor of the City of Rome as a token of friendship between the Citizens of Rome and Toronto. The column is granite (lapis syonites) known to have been quarried in Egypt between 300 and 400 A.D. for a Roman building since destroyed. It was erected on this site with assistance of the Canadian Italian Business and Professional Men’s Association of Toronto and accepted by Mayor William Dennison in 1967. Information obtained from Creating Memory, by John Warkentin. The space behind the Sir Winston Churchill statue is being prepared for this monument, which honours the Canadian soldiers who fought in the Italian Campaign in WWII. The Peace Through Valour Monument presents the 3D printed bronze topographical map of the town of Ortona, where Canadian soldiers fought the fiercest battle in the Italian Campaign, and achieved one of the greatest victories in WWII. Ortona was a beautiful medieval coastal town on the Adriatic Sea that was reduced to ruin and devastation upon the conclusion of the campaign. The renowned Canadian artist Charles Comfort painted several paintings of the destroyed Ortona, and it is from these paintings that the artist Ken Lum drew his inspiration and ideas. At each of the four corners of the map a less than life size bronze statue of a Canadian soldier stands in vigil, as if contemplating the cost of freedom regained in war through human sacrifice and loss of built cultural heritage. The Peace Through Valour Monument is being donated to the City of Toronto by Villa Charities and the Italian Community. Information obtained from artist Ken Lum’s concept proposal.